Love Star Wars? Love video games? Well, as we all know, there’s plenty of choice out there. You can try 2D platformers, 3D racers, a Tekken clone, flight simulators, RPGs, RTS games, LEGO-based adventures, pinball simulations, and more. Still, some of the most beloved Star Wars games belong to the Battlefront series. In the past 13 years, the Battlefront titles have delivered fast-paced Star Wars action on multiple platforms, and though the core gameplay pretty much remains the same, there have been changes aplenty too. 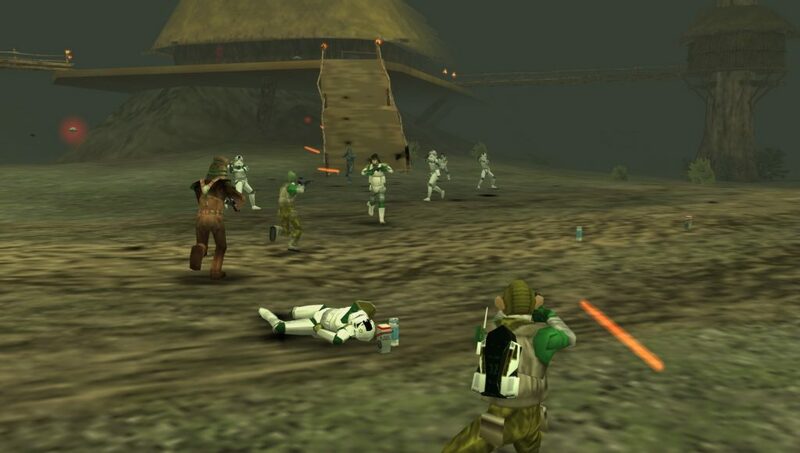 Star Wars: Battlefront was the game dreams were made of when it first landed in 2004. This was no 3D beat-em-up, no platformer, no racing game – this dumped you right on the front line of the series’ biggest battles and let you have at it. Want to step into the shiny boots of a stormtrooper? Fancy sticking it to the Man as a grubby rebel? Always wanted to swoop over Tatooine in an X-Wing? Well, Star Wars: Battlefront had it all, and then some. Though it might seem a tad basic today, Star Wars: Battlefront is still a joy to play. It lacks some of the depth and customisation of later releases, but its fast-paced shooting and tactics keep it an exciting experience. The variety of classes is still decent, and caters to multiple playing styles (aggressive, stealthy etc.). While this was allowed for online multiplayer, Star Wars: Battlefront accommodated fantastic local two-player, and featured three different game modes for single players. Historical Campaign took you through the then-six movies, beginning on Naboo and ending on Endor. Galactic Conquest was a strategic mode, with players picking an era (the Galactic Civil War, Clone Wars etc.) and fighting to conquer one planet at a time. Each world you claimed as your own earned a bonus to aid you in battles, such as advanced training for soldiers or a hero character (Luke Skywalker, Darth Vader, Mace Windu, Count Dooku). Instant Action mode let you pick a map, a side, and play through self-contained battles. Hero characters were optional, but seeing Luke running across Hoth in his X-Wing pilot’s gear with a blue lightsaber in hand was always a treat. Galactic Conquest and Instant Action stayed with the franchise, though with various changes. Historical Conquest was jettisoned, in favour of something deeper. Nobody seemed too cut up about that either, to be fair. Star Wars: Battlefront sold incredibly well, received great reviews, and satisfied fans. A sequel was inevitable – and it came just a year later. Star Wars: Battlefront II made two huge changes: space battles, and playable heroes. The previous game’s airborne combat was decent, but felt seriously limited: some maps allowed little room for exploration, and engaging enemy ships could be tricky. This time, though, we got to experience glorious space-based fights with plenty of room to manoeuvre. This helped to break the grounded missions up nicely, and really captured the Star Wars flavour. Dropping bombs on Star Destroyers, boarding enemy ships, and piloting X-Wings and TIE Fighters in deep space made Battlefront II feel like an entirely different experience to the original. The playable heroes were another great addition. 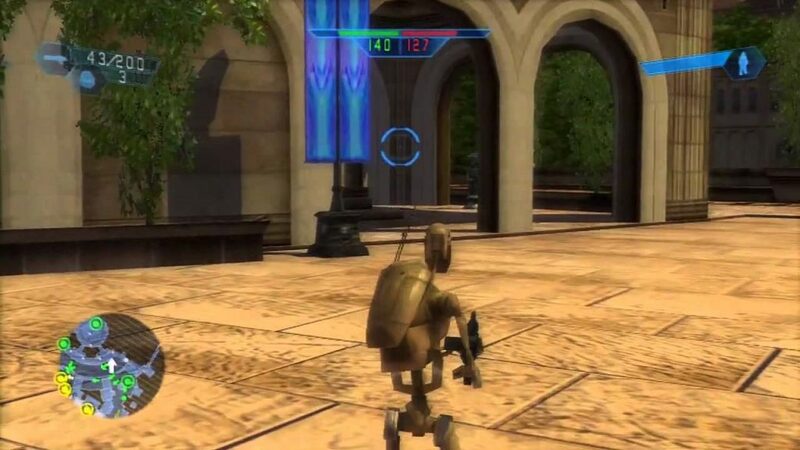 Not only were obvious choices like Luke, Leia, Darth, Han Solo, Chewbacca, Yoda, Dooku, and Boba Fett available, but the likes of General Grievous, Darth Maul, Jango Fett, Obi-Wan Kenobi, Mace Windu, Anakin Skywalker, Aayla Secura, Ki-Adi-Mundi, and Emperor Palpatine were real icing on the cake. 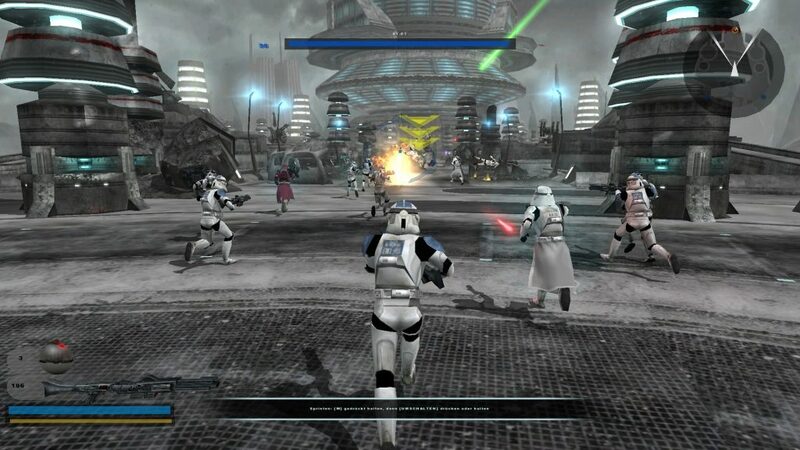 The Historical Campaign had been replaced by a story mode, following the 501st Legion during the Clone Wars. 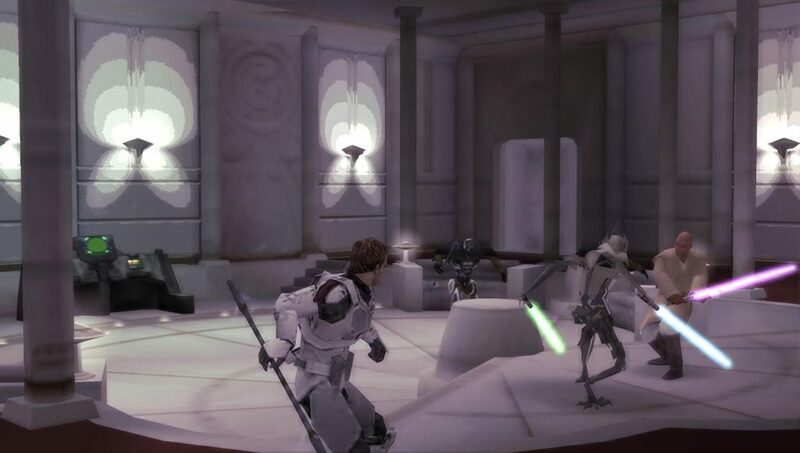 This was a deeper experience, and featured some epic battles – storming the Jedi Temple was particularly impressive, as were missions based on Kashyyyk and Mustafar. Galactic Conquest was much deeper than before: it was more like chess, with two players (or one versus the game) moved across the galaxy, conquering key worlds. Bonuses could be purchased, rather than having to wait until you’d claimed a planet. There was generally more reason to keep playing, too, as performing certain actions enough times would unlock a special weapon or ability – and doing so enough times throughout your career would lead to permanent rewards. The graphics were much better too, and the gameplay felt more strategic, making you feel like a bigger part of the action. LucasArts paid attention to fan feedback from the first game, so it’s no surprise just how well it turned out. The next Battlefront game appeared on the PSP. This was actually the second Battlefront on the handheld console, following a reduced version of Battlefront II, but Renegade Squadron made some big changes to the franchise. First and foremost, the class system was gone. Instead, players had just one character to play as, but were free to customise in a variety of ways (species, uniform colours, loadout). Powerful upgrades were available for purchase, giving a real sense of progression. The gameplay was largely the same, though environments and character models were much more basic. Galactic Conquest was overhauled again, with special commanders bringing bonuses and reinforcements needing to be moved from one planet to another to defend against invasion. Space battles were still impressive, especially given the PSP’s limitations, and several new maps were included. It might not have felt anywhere near as epic or immersive as Battlefront II on consoles, but Renegade Squadron did a great job of moving the series on with less-powerful hardware. This follow-up to Renegade Squadron did something the cancelled Battlefront III was supposed to: introduce ground-to-air combat. This was a big step for the franchise, and made Elite Squadron stand out from previous games. It wasn’t completely seamless, as leaving or entering a planet’s atmosphere or a capital ship triggered a very brief animation. Aside from this, though, it helped to make maps feel far bigger and captured the Star Wars epicness. Being able to go from blasting enemies in corridors to jumping in an X-Wing and soaring towards an enemy ship was a constant highlight of the game, and gave battles an optional structure. If you wanted to play by killing enemies and capturing command posts, you could, but now you had the freedom to wear down ships’ shields and take them out from within. Melee combat let you attack with force pikes or lightsabers when in close range, adding an extra dimension to the gameplay. The story mode, galactic conquest, customisation, and overall presentation were all improved too, making Elite Squadron on the PSP a must-have for Star Wars fans. A Nintendo DS version was released, though it was far inferior to the PSP’s: ground combat was viewed from above (only really going 3D in boss battles) and the space missions were a tad limited, with ships unable to move up or down. The visuals were impressive though, especially the space combat, while the speeder-based sections kept things fresh. It’s surprising that only one Battlefront game for mobiles has been released, especially given how capable today’s smartphones and tablets are. The likes of Galaxy of Heroes and Force Arena do a terrific job, but a 3D shooter in the mould of the PSP games would be ideal. 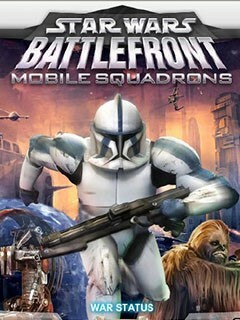 Regardless, Star Wars Battlefront: Mobile Squadrons was a short-lived game, allowing players to choose their sides and era, and keep track of their scores alongside other players’. It wasn’t the best Battlefront game, but it should have paved the way for many more mobile instalments. When gameplay footage of the cancelled Battlefront III emerged, there was a great disturbance, as if millions of voices cried out. It featured terrific graphics, and seamless ground-to-air combat, which makes it a great shame the Xbox 360 and PS3 went without. Though multiple factors led to its cancellation, LucasArts missed out on what could have been a lucrative release. A new Battlefront for consoles was long overdue when EA DICE’s Star Wars Battlefront reboot hit the market in late 2015. Though anticipation was massive, the game received a chillier reception than many of us expected, due in large part to the lack of content at launch. Other complaints included no longer being able to simply climb into vehicles littering maps, no campaign mode, no prequel content, and no space battles. DLC made up for some of this by introducing more maps, characters, and space combat, but many fans were left wanting more. 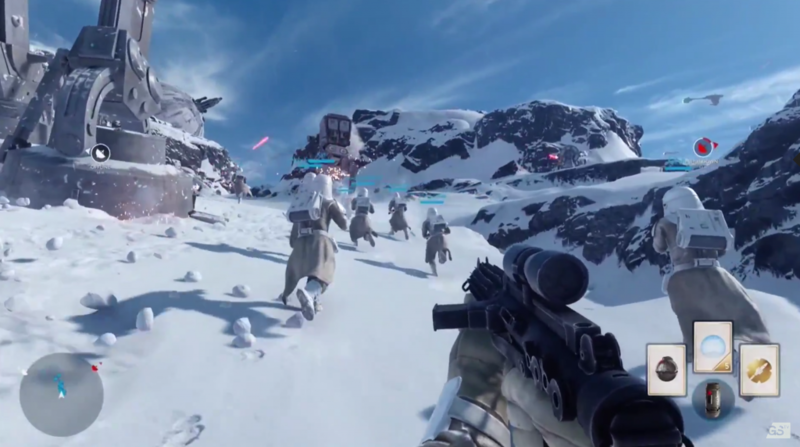 Star Wars Battlefront’s graphics, music, and sound were outstanding, though, with an amazing attention to detail. It seemed a step back from earlier games in some ways, but laid a solid foundation for inevitable sequels. The upcoming Star Wars Battlefront II looks set to be the game fans have wanted for so long. 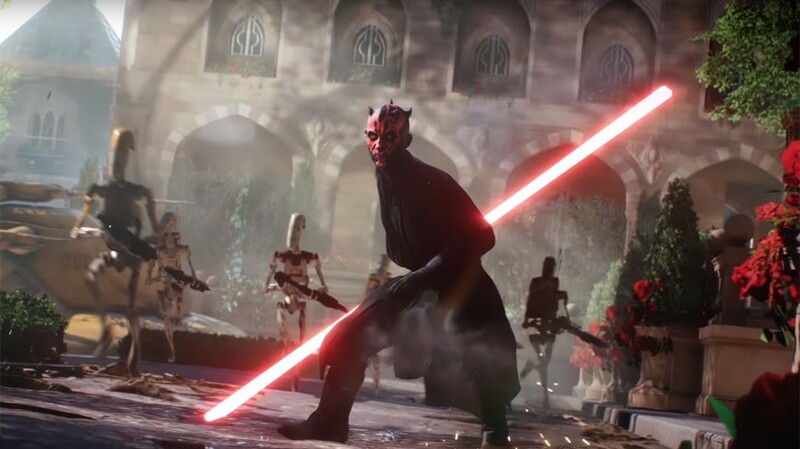 First and foremost, content from the original movies, prequels, and new films are included, while a deep story-driven single-player campaign mode has been added to the mix. DLC content is expected to be free, and playable heroes will include Rey, Kylo Ren, Captain Phasma, Finn, as well as the likes of Darth Maul, Han Solo, and Boba Fett. The campaign will feature sections based around controlling heroes (Luke, Kylo Ren etc. ), but the main character is an Imperial soldier. You’ll play as her in the wake of the second Death Star’s destruction, going through ground and space missions. The latter has clearly been improved, with refined mechanics and less automation. Missions will also offer more variety, with diverse structures and altering pace – it won’t always be straight shooting. There will be more customisation options, and classes will be available, letting you choose between playing as a sniper, an engineer, a soldier, and artillery specialist. Hopefully, Star Wars Battlefront II will be the series’s best instalment and truly make us feel like we’re in that galaxy far, far away. With Star Wars Battlefront II due to drop soon, we decided to look at the long-running series’ evolution. What’s your favourite Battlefront game, and why?